Escape is a great example of a product that caters to modern demands on all levels. It's compact, urban-friendly size, exceptional fuel economy and smartphone technologies offer the efficiency and on-demand connectivity that today's drivers are looking for. Plus, if you check out the 2016 Ford Escape in Grapevine, we're sure you'll find that it fulfills your desire for amenities, too. Whether you choose the S, SE or Titanium, Escape knocks it out of the park with a glut of features that are hard to find at the same price range. From a voice-activated SYNC system with smartphone app integration to a rearview camera, USB port, MyKey parental controls, keyless entry and Bluetooth, the SUV packs a lot of value. If you're shopping for a 2016 Escape in the Dallas metro area, you're also sure to appreciate top-of-the-line features like the Titanium's power liftgate. It opens with the simple swipe of a foot under the back bumper, making it a breeze to gain trunk access when your hands are full. In addition, this year's shoppers can upgrade to the brand-new SYNC 3 system, which replaces MyFord Touch and provides greater functionality than the base SYNC unit. 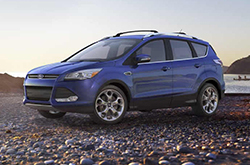 The new interface offers a number of enhancements that 2016 Ford Escape reviews extol, including faster performance, improved voice recognition, smartphone-like touch controls, up-to-the-minute Wi-Fi updates and Siri integration. Other notable changes this year include two new paint colors, Shadow Black and Electric Spice, and the addition of a new SE Chrome Appearance package with chrome door handles, a chrome-embellished grille, side-mirror skullcaps, 19-inch wheels and other high-end upgrades. Under the hood, the 2016 Ford Escape in Grapevine offers three engine choices, which carryover from last year. The Escape S gets a 2.5-liter four-cylinder capable of producing 168 horsepower, while SE and Titanium models come appointed with a 1.6-liter EcoBoost four-cylinder that achieves an EPA-estimated 32 mpg highway and 178 horsepower. The third engine, a 2.0-liter turbocharged EcoBoost four-cylinder, is optional on the SE and Titanium and 2016 Ford Escape reviews say it's the best choice for shoppers who desire greater power. The turbo engine rates in at 240 horsepower and still delivers excellent fuel economy, reaching up to 30 mpg highway with FWD. 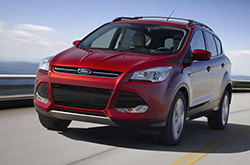 Want to know even more about the Ford Escape? Continue reading below to see additional specs! 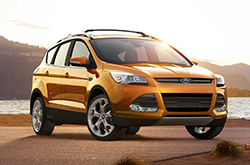 Compare the 2016 Ford Escape next to vehicles like the 2016 Toyota RAV4, Honda CR-V and the Subaru Forester, and we're sure you'll find that the Escape scores higher than the competition in a multitude areas. If the Escape's budget-friendly MSRP and unique cabin amenities don't persuade you that it's the right vehicle for your needs, we're sure its tasteful looks will seal the deal. It's a spectacular value. Just compare its price to the vehicles listed above and you'll clearly see why so many Grapevine drivers love it. Take a look at our bullets for more details about its vehicle specs! For reviews of the 2016 Ford Escape and preceding models, Grapevine Ford is your trusted resource. Don't stress out over your next purchase; look to the premier Ford retailer in Grapevine for thoroughly researched reviews recorded by industry specialists. To make good decisions when it comes to your next Ford purchase, don't guess! Each paragraph is brimming with data, including info about vehicle features, in an easy-to-understand clear layout. Want to read other Ford car comparisons and reviews? Then visit our digital research archive, where you'll learn about other new vehicles available at Grapevine Ford.